These are the yellow pear tomatoes. 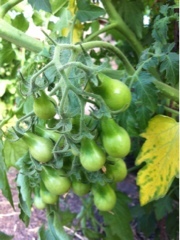 Forming on the vine, getting ready to ripen. We hope they do it quick, but it seems the first ones always take forever! So ready for fresh tomatoes. Bring. It. On.